We’re anticipating a very active and dynamic sales process as interest is already growing for these properties, which represent a range of assets and opportunities. 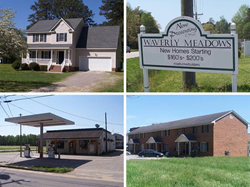 Richmond-based SVN/Motleys—a founding member of Sperry Van Ness® Auction Services, a national provider of date-specific sales and special asset solutions—is coordinating the accelerated sale of 150+/- revenue-generating and development properties in areas south and east of Richmond, Virginia. These include income-producing commercial properties, rental assets, multi-parcel development opportunities, and commercial and residential zoned building lots in southern Chesterfield, Colonial Heights, Chester, Petersburg, Dinwiddie, Prince George, and Waverly. Individual properties will be offered in the online bankruptcy auction starting July 15 with all sales ending by July 30. The process features SVN’s leading edge, secure and user-friendly online bidding platform, however, two onsite bidding centers will be available on select days. For more details on the auction and properties, visit http://www.SVNBid2Win.com. SVN Auction Services is a provider of date-specific sales and special asset solutions. It encompasses an elite group of local and regional auction advisors throughout the United States who specialize in areas such as foreclosures, tax sales, multi-properties, receiverships and bankruptcies. SVN Auction Services offers the industry’s most comprehensive spectrum of auction solutions—from rapid asset resolution and 30-day countdown asset sales to wide area and high impact/high promotion events. As part of one of the most recognized and reputable commercial real estate firms in the industry, SVN Auction Services is supported by SVN International’s more than 800 commercial real estate advisors throughout the nation. This relationship provides outstanding opportunities for SVN Auction Services to serve clients needing to move assets in accelerated timeframes and creates significant value for buyers and sellers. For more information, visit http://www.svnauctions.com.